KELOWNA, BC – Building on the popularity of the year-round Hop Head IPA and the seasonal Hop Head Double IPA, Tree Brewing has expanded its Hop Head brand to include a new limited edition brew. The brew is a dark brown/black colour, and delivers an aroma of roasted malt tones. With five different varieties of superior hops and six malts, the new Hop Head Black IPA recipe brings out a malt forward taste with a lingering hop bitterness. 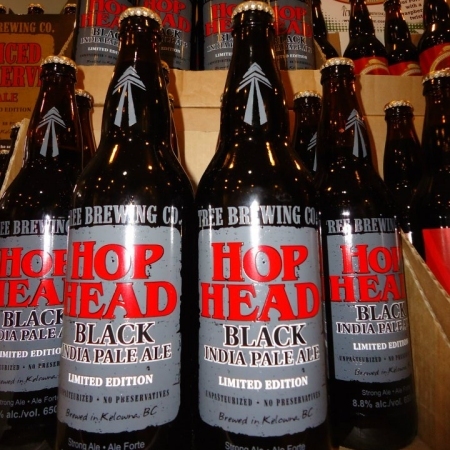 Hop Head Black IPA is available now in 650 ml bottles at select liquor stores in British Columbia. It will also be available in Ontario later this spring as part of a Tree Brewing spotlight release at select LCBO outlets.